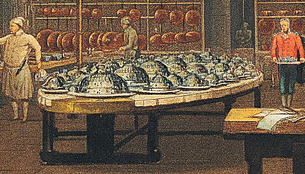 Slater's Steam Kitchen, 1812 was one of many styles of cooking apparatus using steam to prepare food. The upper container 'A' held water which was heated by a fire box 'C' with its ashes falling below. Tin square 'kettles' were submerged in the hot water and steam, with their rims flush to the iron top. More details are given with the image. Other styles were kettles placed on the cook stove, neighboring table or cabinet. The steam was piped into the base of each pot, then it could be used for other purposes such as the steam table, below, which kept prepared dishes hot until taken to the table.